Diabetes mellitus is a lifelong disease which causes negative effects on patient life. As a result of the disease, patients suffer from high blood sugar and the inability to obtain energy effectively from food. Diabetes mellitus can lead to life-threatening complications such as blindness, cardiovascular disease and diabetic coma. Diabetes can arise from defective insulin hormone production (usually related to type 1 diabetes mellitus or insulin-dependent diabetes mellitus (IDDM)) and/or defective insulin hormone function (related to type 2 diabetes mellitus). IDDM usually occurs in young people and can cause many serious health problems. There are several treatments which been investigated and applied in patients. Among them, stem cell therapy (especially hematopoietic stem cell therapy) has great potential to treat diabetes due to its many distinct advantages. The review will focus on diabetes mellitus, hematopoietic stem cells, and the novel hematopoietic stem cell therapy in diabetes mellitus type 1 treatment. According to the World Health Organization, diabetes is a chronic disease in which the pancreas does not release enough insulin for the body to use or the insulin response of the body becomes ineffective American Diabetes, 2011 . Both circumstances lead to hyperglycemia. When high glucose is present in the blood for a long time, it will damage other parts of the body and cause many serious complications such as blindness, amputation, and cardiovascular disease. Diabetes mellitus is usually categorized into 3 types Alberti and Zimmet, 1998 . The first type is Type 1 diabetes (T1D), which is essentially an autoimmune disease whereby the immune system attacks the pancreas and inhibits insulin production. Insulin is a vital hormone which stimulates the transportation of glucose from peripheral blood to functional cells to provide energy for cells. The second type of diabetes mellitus (Type 2 diabetes) occurs when insulin is not used effectively in the body. The third type is gestational diabetes which occurs during pregnancy when blood glucose levels are higher than normal but below those diagnostic of diabetes. Although type 1 diabetes mellitus comprises about 5–10% of all diabetes cases, it occurs mainly in children. It is estimated that 80,000 children suffer from this disease each year. Thus, it is important to understand the underlying mechanisms of the disease and to develop effective therapies to combat the disease. The exact cause of T1D (also known as insulin-dependent diabetes mellitus (IDDM)) is still unclear but it is believed the major factors are a combination of genetic and environmental factors. Genetically, the MHC HLA region of chromosome 6p21 (also called the IDDM1 locus) is well-known for increasing susceptibility for T1D. It is associated with 40-50% of the familial aggregation of T1D Noble and Valdes, 2011 . The HLA haplotypes contain high risk haplotypes, moderate haplotypes, and protective haplotypes. Specifically, the class II genes are the main contributors, along with DRB1-DQA1-DQB1 haplotypes, to be strongly associated with T1D van Belle et al., 2011 . The IDDM2 locus is the insulin gene region on chromosome 11. It is a variable number of tandem repeat (VNTR) polymorphisms that account for the high risk of T1D Kantarova and Buc, 2007 . In addition IDDM1 and IDDM2, there are many other genes related to susceptibility to T1D; these include cytotoxic T-lymphocyte antigen-4 (IDDM12), protein tyrosine phosphatase non-receptor type 22 (PTPN22), the gene encoding the alpha chain of the IL-2 receptor, and so on Kantarova and Buc, 2007 . Although patients have autoantibodies against islet antigens, it may take several months to several years for hyperglycemia to occur van Belle et al., 2011 . Therefore, environmental factors must play a critical role in promoting the disease. These factors include viral infections, bacteria, cow’s milk, and wheat proteins, among others. Indeed, scientists have shown that enteroviruses, specifically coxsackieviruses, are strongly involved in the progression of the disease. Viruses cause IDDM via infecting beta cells or inducing the immune system to attack beta cells due to local inflammatory reactions or cross-reactivity with islet antigen Roivainen, 2006 . Bacteria involved in the IDDM induction process usually come from the intestine where exposure of bacterial antigens to the immune system occurs Vaarala et al., 2008 . In addition, albumin in cow’s milk is also a factor which can cause the immune system to attack beta cells since cross-reactivity has been discovered for serum antibodies to albumin and ICA1, a surface protein of beta cells Karjalainen et al., 1992 . The timeline of IDDM can be summarized in 6 steps. Firstly, people carry susceptibility genes as listed above. Secondly, there must be environmental trigger(s) which activate the autoimmune process. Thirdly, autoreactive CD8 T cells attack beta cells and in the process beta cell antigens are released. Next, the antigens are taken to the lymph nodes where the immune responses are amplified. Step 5 involves epitope spreading, a process which leads to severe depletion of beta-cell function and mass. Lastly, clinical diabetes arises when beta-cells are significantly destroyed. Although some beta-cells can proliferate under stimulation of autoimmune inflammation, most beta-cells die van Belle et al., 2011 . There are many treatments for IDDM such as insulin injection, insulin pump, islet transplantation, and/or beta cell transplantation. Each treatment has pros and cons. For example, although insulin therapies can provide insulin to the body to control hyperglycemia, they cannot manage blood glucose effectively the way beta cells do when blood glucose levels change in the body. 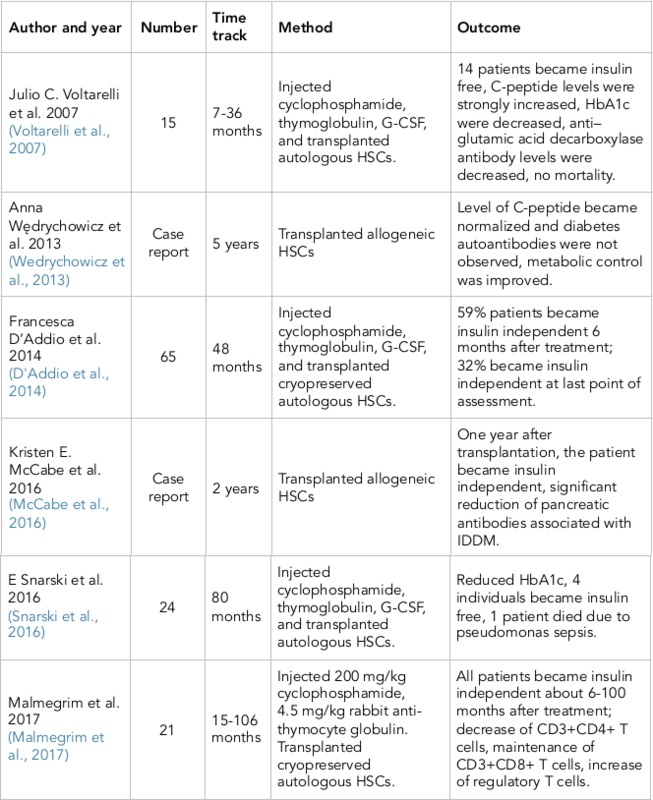 Islet and beta cell transplantation may overcome some of the disadvantages of insulin injection but some pitfalls are that there is a lack of donors and patients must use immunosuppressive drugs which can have many side effects Li and Ikehara, 2014 . In light of limitations of the other therapies, stem cell therapy has emerged as a promising platform for the treatment of IDDM. There are two types of stem cells that have been studied: mesenchymal stem cells (MSCs) and hematopoietic stem cells (HSCs). MSCs can be collected from umbilical cord blood, adipose tissue, and bone marrow. MSCs have the ability to replace beta cell death, modulate immune system, recruit autologous stem cells, and/or release growth factors. Beside MSCs, HSCs have also been evaluated and found to have great potential in IDDM treatment since HSCs are thought to be able to restore immune system function and prevent the autoimmune process associated with IDDM. Hematopoietic stem cells (HSCs) are a type of stem cells which give rise to the hematological system of the body. HSCs are classified into 2 types: long term HSCs (LT-HSCs) and short term HSCs (ST-HSCs). LT-HSCs are slow-cycling cells which mostly stay in the quiescent stage and contribute to continual hematopoiesis. In contrast, ST-HSCs strongly proliferate and differentiate into progenitor cells. However, ST-HSCs limit their reconstitution ability to several weeks. In general, HSCs differentiate into myeloid progenitor cells and lymphoid progenitor cells. These progenitor cells will create myeloid lineages like erythrocytes, thrombocytes, macrophages, etc., as well as produce lymphoid lineages like natural killer cells, T cells, and B cells. The first research study on HSC transplantation showed that when HSCs were transplanted into a mouse model of bone marrow depletion, the immune system of the mice could be recovered McCulloch and Till, 1960 . Therefore, HSCs have been evaluated and applied to treat blood-related diseases, specifically immune diseases, and have demonstrated encouraging results Futrega et al., 2016 Gatti et al., 1968 . In adults, HSCs are located in stem cell niches in the bone marrow. It is widely accepted that there are two kinds of HSC niches; these are endosteal niches (osteoblast niches) and sinusoidal niches (vascular niches) Yin and Li, 2006 . Endosteal niches appear near the inner surface of the bone which contain osteoblasts to support HSC maintenance, especially LT-HSCs. The sinusoidal niches are near the center of the bone which contain sinusoid endothelial cells, which are thought to have an essential role in HSC proliferation and differentiation. The connection of HSCs with osteoblasts or endothelial cells in different niches can determine the status of the HSCs throughout many signals. The common profile markers of HSCs are CD34, CD38, CD90, CD133, CD105, CD45, and c-kit. Meanwhile, HSCs are negative for lineage markers (lin-). These markers are slightly different between human HSCs and mouse HSCs. For instance, while mouse HSCs strongly express CD38, human HSCs express low or no CD38 Bhatia et al., 1998 . According to the International Society of Hematotherapy and Graft Engineering, CD34+CD45- marker profile is used to determine HSCs by flow cytometry Pham, 2017 . To study the effects of HSC in IDDM treatment, biomedical scientists have widely used mouse models of IDDM. There are several types of models; these include spontaneous models like non-obese diabetic (NOD) mice and BDC2.5/B6g7 (a modified model whereby the TCR genes specific for a random pancreatic islet β-cell antigen (BDC2.5/B6g7 transgene) are rearranged). As well, pharmacological models exist such as streptozotocin (STZ)-induced and/or alloxan-induced mice Kang et al., 2005 Van Belle et al., 2009 . NOD mice were created by Makino et al. in 1980. These mice have mutations in the CTLA-4 gene Leiter et al., 1987 , which means T-cell response will no longer be suppressed, leading to T-cell attack on insulin-producing beta cells. Indeed, NOD mice develop IDDM at about 5 weeks of age. Most studies have used NOD mice to test the effects of HSC transplantation. In addition, studies have used streptozotocine-induced mice in diabetes research. For example, Yonathan Gomez et al. carried out a research study in which they injected STZ into C57BL/6 mice to induce IDDM via beta cell damage. After that, they injected G-CSF and AMD3100 to recruit autologous HSCs from bone marrow. The results showed that the treated mice had a reduction of hyperglycemia and an improvement of insulin levels Gomez et al., 2017 . In addition, Elizabeth M. Kang and colleagues demonstrated that HSC transplantation could prevent IDDM in NOD mice although the cells could not regenerate islet cells once disease was established Kang et al., 2005 . Beilhack et al. compared the effectiveness of bone marrow grafts and purified HSCs when the two were transplanted to NOD mice. The results showed that although NOD mice which received purified HSCs had more T cells than the mice receiving bone marrow, they did not suffer from hyperglycemia and their islets were recovered well Beilhack et al., 2003 . Regarding the ideal time to inject HSCs in NOD mice, Nan Wang et al. found that young NOD mice (about 4-6 weeks age) had better outcome when they were transplanted with HSCs at that age, compared to the older NOD mice (about 3 months age). They explained that the effect was due to the fact that regulatory T cells were more abundant in younger NOD mice than in older mice; conversely, there were fewer conventional T cells in young mice than in older mice. Therefore, T cell subsets likely cause different effects on therapy in mice Wang et al., 2015 . As HSC transplantation has been demonstrated to be safe and effective in NOD mice, in the clinic there has now been many research studies evaluating HSC therapy in IDDM patients. In clinical research, HSC therapy is usually combined with immunosuppressive therapy Voltarelli et al., 2007 ( Figure 1 ). At the beginning, researchers “reset” the immune system by administration of a high dose of immunosuppressive drugs such as cyclophosphamide (CY) or thymoglobulin Ahlmann and Hempel, 2016 . CY is referred to as a chemotherapy drug and has been classified as an “alkylating agent”. After injection in the body, CY is transformed to 4- hydroperoxycyclophosphamide (4HC) and aldophosphamide (AP) in the liver Brodsky, 2002 . In cells which have high levels of aldehyde dehydrogenase (ALDH) like HSCs, AP is converted to a harmless substance (carboxyphosphamide) and these cells will not be affected. However, in cells which have low levels of ALDH like autoimmune effector cells, AP is changed to phosphoramide mustard and will induce cell death. Most lymphocytes, T cells, B cells, and NK cells, when exposed to phosphoramide mustard, will die resulting in the depletion of autoreactive effector cells Brodsky, 2002 . After treatment with high-dose cyclophosphamide, patients are injected with autologous or allogeneic HSCs and monitored for the effects of transplantation. The research outcomes are presented in Table 1 . In general, after HSC transplantation, health of IDDM patients are improved via insulin independence, HbA1c level decreasing, and C-peptide level increasing. These results lend support to the observation that HSCs are safe. Indeed, HSCs can stop the attack of the immune system on beta cells so that diabetic disease is alleviated or prevented. HSC can be isolated from bone marrow, peripheral blood or umbilical cord blood. The patients will be conditioned by TBI, ATG, cyclophosphamide or others. Then they will be transplanted with HSCs or HSCs enriched MNCs. 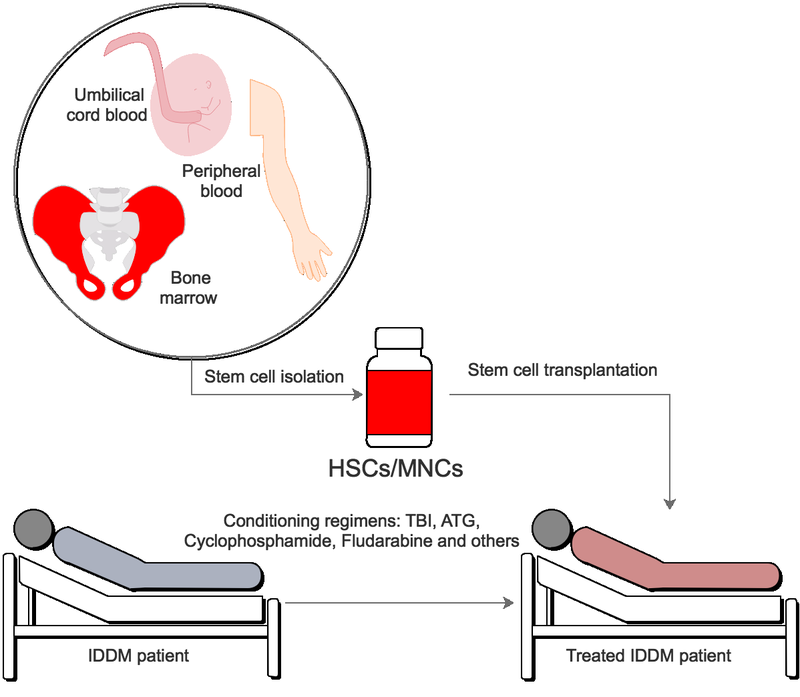 HSC transplantation has shown great potential as a therapy for IDDM. Both preclinical and clinical studies have demonstrated that HSC therapy can lead to positive effects on the recovery of IDDM. HSC therapy can help correct immune system function and protect beta cells from attack by immune cells. Further investigations of HSC transplantation are warranted as it represents a novel and promising therapy for IDDM treatment. VT-VB and PVP equally contributed in the ideas, and wrote this manuscript. All authors read and approved this manuscript.